I went out last night with a group of my friends from grad school and we checked out a tapas place downtown called Málaga. It was so cold and Beth and I ended up getting there before they even opened but they kindly let us in. 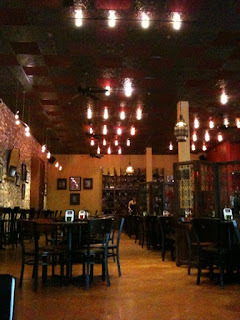 I loved the ambiance; it reminded me a lot of the restaurant where we got married with the warm yellows and reds and cozy lighting. 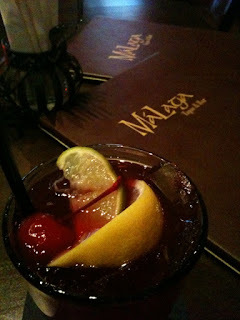 I ordered Sangria, so good. 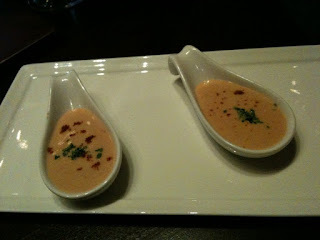 The chef brought us a taste of the shrimp bisque to warm us up and it was so rich and delicious. 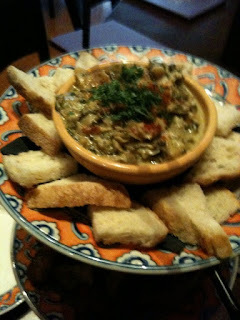 This spinach and artichoke dip was amazing, with a nice level of heat and it was made without creamy ingredients like the American version. We ordered several other tapas including patatas bravas (deemed good but not authentic) and some pork, chicken, and meatball dishes. They came out on three tiered serving plates. There ended up being five of us total, a really good size, and we all ended up meeting at least one new person in the mix. It was a perfect happy hour. The pictures are from my phone so forgive the low quality but I couldn't help myself, I really wanted pictures from Málaga to show Austin. I cannot wait for him to check it out and it's now on our must-do list for visitors. First day of spring semester!